Tesla says its Roadster can travel 244 miles per electric charge. MUNICH -- Daimler AG said today it has acquired an equity stake of nearly 10 percent of California electric car maker Tesla Motors Inc. The two companies have been working closely to integrate Tesla's lithium-ion battery packs and charging electronics into the first 1,000 units of Daimler's electric Smart car. Daimler said its stake in Tesla will allow the companies to collaborate even more closely on the development of battery systems, electric drive systems and in individual vehicle projects. "Our strategic partnership is an important step to accelerate the commercialization of electric drives globally," said Thomas Weber, Daimler's head of research. Tesla, based in San Carlos, is the only production automaker selling a highway-capable electric vehicle in North America and Europe. Tesla CEO Elon Musk said the lithium-ion pouch-cell battery developed by Daimler is of interest to Tesla. "We are looking forward to a strategic cooperation in a number of areas including leveraging Daimler's engineering, production and supply chain expertise," Musk said in a statement. "This will accelerate bringing our Tesla Model S to production." As part of the collaboration, Herbert Kohler, Daimler's vice president of E-Drive and Future Mobility, will get a Tesla board seat. 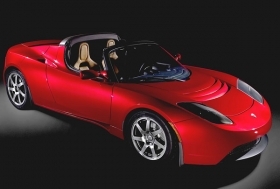 Tesla currently sells the Roadster in North America and Europe. The company says it can travel 244 miles per charge with zero tailpipe emissions and has fuel economy equivalent to 256 mpg. In March, the company unveiled the Tesla Model S, which it says is the world's first full electric sedan. Tesla plans to produce the car in California starting in late 2011. Daimler is seeking to be a leader in the industrialization of lithium-ion technology. In March, the company founded the Deutsche Accumotive GmbH, a joint venture with Evonik Industries AG. The joint venture will create the first vehicle manufacturer to develop, produce and market batteries for automotive applications, Daimler said. The German carmaker has been testing 100 Smart ForTwo electric cars in London since 2007. Later this year, the Smart assembly plant in Hambach, France, will start production of up to 1,000 ForTwo cars with electric drive. The cars will be used for testing programs in Berlin and Italy. Daimler is also starting small-series production of the Mercedes-Benz B class with a fuel cell drive system later this year. In 2010, the company will introduce its first battery-powered Mercedes-Benz. Starting in 2012, Daimler plans to equip all Smart and Mercedes-Benz electric vehicles with own produced lithium-ion batteries.